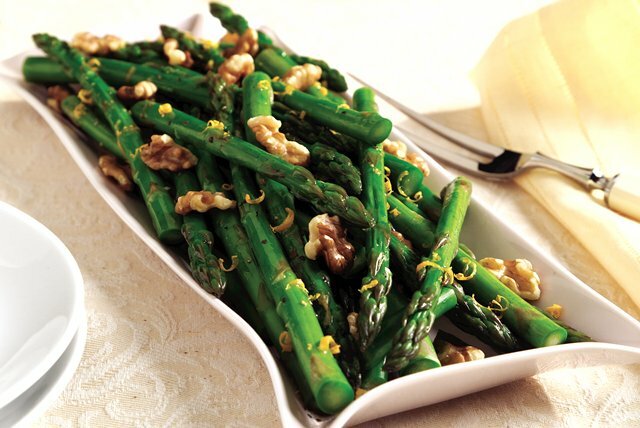 Create a tasty side dish with our Blanched Asparagus with Toasted Walnuts recipe! Blanched asparagus goes great with other Passover or Easter dishes. Grate peel and squeeze juice from orange. Pour juice into small saucepan; set peel aside for later use. Bring juice to boil on medium-high heat. Reduce heat to medium-low; simmer 10 minutes or until juice is reduced by half. Meanwhile, blanch asparagus in boiling water; drain. Add oil to orange juice; beat with wire whisk until well blended. Stir in salt and pepper. Place asparagus on serving platter; drizzle with orange juice mixture. Sprinkle with orange peel and walnuts. To blanch fresh asparagus, add the spears to a large pot of boiling water. Cook, uncovered, for 2 to 3 minutes. Drain, then immediately plunge the asparagus into a bowl of ice water to stop the cooking. When completely cool, drain and pat dry. Preheat oven to 350°F. Place walnuts on baking sheet. Bake 8 to 10 minutes or until lightly toasted.